This international food and wine festival to be celebrated in Nuevo Vallarta will feature chefs, mixologists, sommeliers and celebrities for five days of good taste, great beaches and luxurious surroundings. The successful combination of gastronomy and celebrity chefs is back again in Mexico’s Pacific Treasure from April 13-17 2016, when the Villa La Estancia Luxury Beach Resort & Spa Riviera Nayarit will present its latest event: Cuisine of the Sun. The list of celebrity chefs is headed by US Foods’ Culinary Specialist, Penny Davidi, who will be joined by Michele Ragussis, Adam Gertler, Partick “Pat” Neely, Manouschka Guerrier, Martita Jara, Stephen Kalt, Rahm Fama and mixologist Mia Mastroanni. This international food and wine festival will also feature celebrities from the entertainment industry, including actor Dennis Haysbert, who already confirmed his attendance. “We’ll have cooking demos, brunch, wine tasting and great mixology demos put on by some of the best professionals in the industry. We’ll have various beach events, from fine dining to roasts by the shore and we’ll sip incredible drinks made from the most famous tequilas and liquors from unique destinations around Mexico and the world”, commented Olivier Coupat, General Manager of Villa La Estancia. 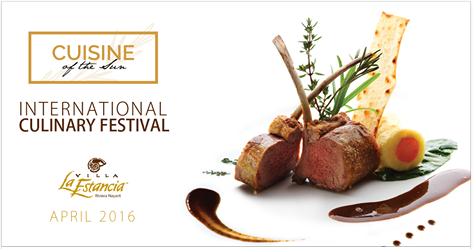 Follow the details for this new event in the Riviera Nayarit’s Villa La Estancia at their official site: http://cuisineofthesun.villagroupresorts.com/.